New research has discovered a fascinating hidden history of the Selden Map, the oldest surviving merchant map in the world. About 60 inches long and 40 inches wide, the map was drawn in ink and hand-painted with watercolors between 1607 and 1619. It plots 18 trade routes in an area of East Asia bounded by Siberia to the north, the Spice Islands to the south, Japan to the east and southern India and Burma to the west. 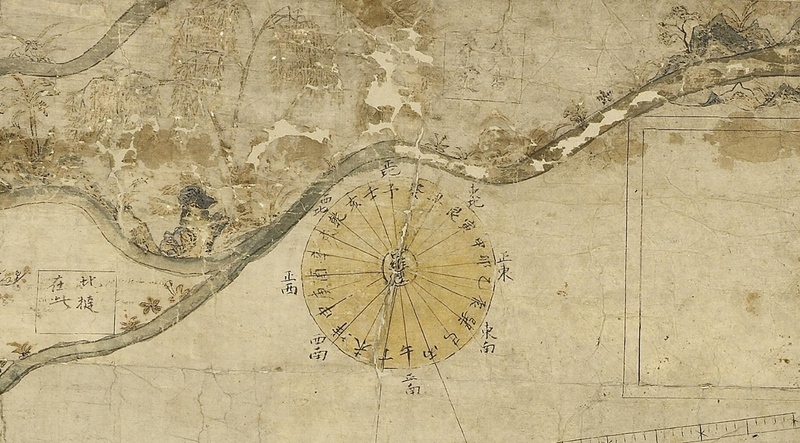 At the top of a map is a compass labeled in Chinese characters to indicate the orientation of the map. The routes all start from the port city of Quanzhou in China’s southern Fujian province, which at the time this map was drawn in the late Ming Dynasty was a major shipping hub for trade between Asia, the Middle East and Europe. The “very odd” map was often put on display, unfortunately to its detriment, but it fell out of fashion in the 18th century after famed astronomer Edmond Halley declared it cartographically inaccurate. In 1919, the Selden Map was mounted on a linen backing so it could hung on the wall. This would have disastrous consequences. The fabric backing stiffened over time, distorting and cracking the fragile paper, and its brittle condition was exacerbated by being kept rolled up. In the 1970s conservators noted the map’s dire condition, but decades would pass before the conservation issues were addressed. In 2008, ﻿Robert Batchelor, a professor of British and Asian history at ﻿Georgia Southern University, sought out the Selden Map. 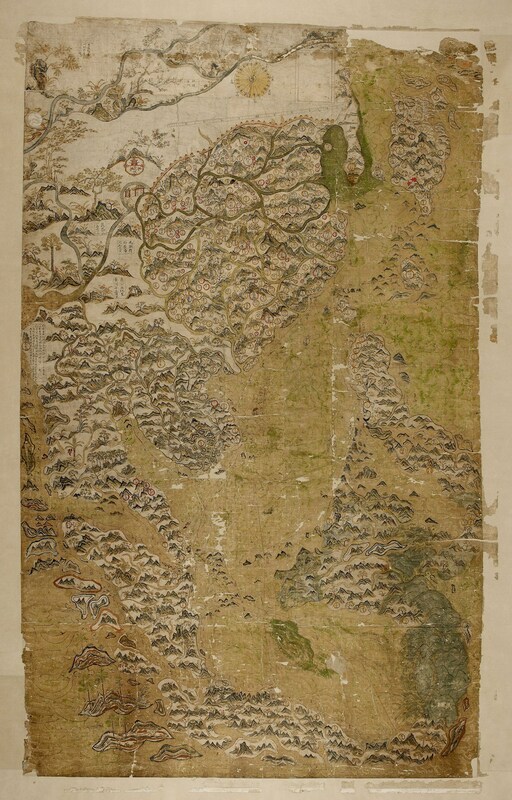 He identified two features on the map which made it unique compared to all other known historic Chinese maps: 1) it’s not a map of China, and 2) the shipping routes plotted from Quanzhou. China was placed in the center of other maps, but in this one it’s just one of many countries around the South China Sea that traded with each other. The shipping routes marked it as the earliest example of Chinese merchant cartography, commissioned by traders, not the imperial court. It also contravenes the received wisdom that China was isolated from the rest of the world during this period. Its merchants were still doing plenty of business. Batchelor’s research spurred a new conservation and restoration plan. This time conservators took their time, researching past interventions to determine what parts of the map were original and which later alterations, if any, should be kept. They decided to keep a border added the map in the late 17th century because of its historically significant Latin annotations. The linen backing and earlier patching attempts were removed. The restored map was digitized and put online. Examinations of the pigment used found a mixture of indigo with orpiment, a yellow mineral – rather than gamboge, a yellow dye – to make a green colour, which is also very unusual for a painting in China in this period. And the detection of a basic copper chloride in the green areas suggests an influence from south and west Asia, where it was often used in manuscripts. This green pigment was not typically used in paper-based paintings from China. Detailed examination even found instances where the cartographer made alterations – some stylistic, others unintentional, and some made as the cartographer’s knowledge of a certain area developed. The scientists were able to identify that the trade routes were laid down before the land was drawn in. They believe that the cartographer did not plan the full map from the beginning, which was why they had to redraw some of the routes many times – and why they ran out of space at the southern and western points of the map, forcing the trade routes to be off the compass directions. Two trade routes were drawn without their corresponding compass directions, suggesting the map was unfinished. As a result of this new evidence, the research team proposes that the map was drawn not in China, but in Aceh on the island of Sumatra. It is the most westerly port in south east Asia marked on the map and has the longest history of the presence of Islam in south east Asia, as well as a long history of Chinese contact. The new research has been published in the journal Heritage Science and can be read in its entirety free of charge here.